UPDATE (10/4/10): Congrats to reader Jake M., whose name was randomly selected as the winner of the prize pack! Have you spotted the new Bisquick Gluten Free baking mix at your local market? I've found it at Wegmans and ShopRite over on the Jersey side of the Delaware. (The mixes are now available at Amazon.com through this link.) 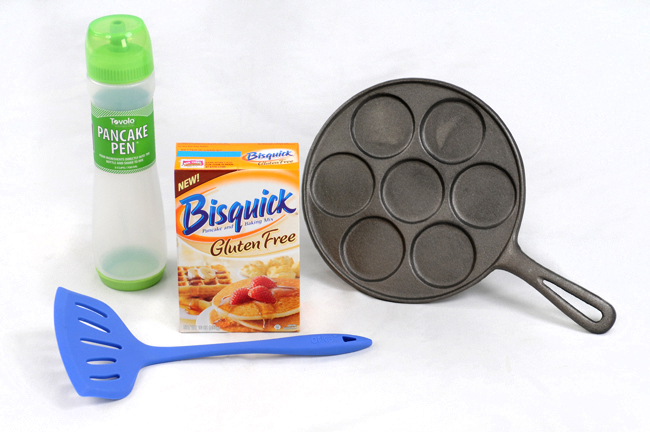 With Bisquick Gluten Free, you can make favorites like pancakes, waffles, biscuits and more. At the product homepage, you'll find many gluten-free recipes for meals and desserts such as Chicken Dumplings, Cheeseburger Pie, Coffee Cake and French Apple Pie that incorporate Bisquick Gluten Free. You can visit MyBlogSpark to download a printable coupon for $1 off the new mix. MyBlogSpark has generously offered a Bisquick Gluten Free prize pack, which includes a box of the mix, a pancake pan, pancake pen and a pancake flipper, to a lucky Gluten Free Philly reader. To enter the giveaway, leave a comment to this post about what you'd like to make with the mix. The giveaway runs now through Sunday, October 3 at 11:59 p.m. Eastern Time. I’ll randomly select one winner the next day and will contact him or her by email. If I don’t hear back from the person with his or her mailing address by the following Tuesday at 8 p.m. Eastern, I’ll select another name. I would love to make biscuits with this mix. There are some good gf pancake/waffle mixes but I haven't tried making biscuits yet. Looking forward to trying them! I'd like to try to duplicate a coffee cake recipe my mom made when I was young. It had a distinctive taste to it, and I haven't been able to get it quite right with just the gluten free flours. I would love to make my 4 year old daughter's favorite breakfast food....pancakes!!! She was just recently diagnosed and haven't found any good gluten-free breakfast items for her! Before we became gluten free my family loved bisqick biscuits. I used the mix to make the topping for chicken and dumplings and fruit cobblers. On weekends I would make chocolate chip pancakes. I would love to cook all our old favorites! I would love to make biscuits and chicken & dumplings! Can't wait to try it! I love baking gluten free, especially when the texture is spot on, i hope that is the case with this mix. my mom has celiacs and it is so tough to even order food at a restaurant! hope i win! I have made the pancakes, biscuits and strawberry shortcake recipe. My family loved it! My daughter and I have Celiac disease so having this product is a life saver! Looking forward to trying the pizza crust recipe. Oh how I miss the taste and texture of biscuits! I am hoping that once I get my hands on the gluten free version of the mix that it takes care of that! Oooh, and shortcake! It is past strawberry season but I miss that too! One of the most effective ways to convince my kids going gluten free would not be the end of all that is wonderful has been to make more pancakes. Takes a lot of playing with recipes to make a gf pancake they like and some handy tools like these would really help. I am so excited about this mix! I can't wait to make some pancakes and try out the biscuits too! Chicken and Dumplings, hands down. My mom used to make it when I was little and it was such a comfort. I haven't had it for a good ten years or more and would love to give it a shot now that I'm GF. OMG, what I would't make with the GF Bisquick. I am most looking forward to making REAL Shortcakes for strawberry shortcake and the impossible pies. I have not been able to find the Bisquick here in Del yet. I contacted the company last month and they said it wasn't even in their system yet to be able to tell me where to find it!!!!! to just keep checking Walmarts and Targets. I am so looking forward to real strawberry shortcake! since I made pancakes that were light and fluffy. It would be great to win this package. Just as summer is ending and while I can still get fresh peaches and blueberries, i plan to make a blueberry and peach cobbler! Oh, that set would be perfect for my celiac Cub Scout! Not only a quick and easy mix for pancakes on the scout camping trips, but clean, totally fresh and GF tools for him to cook with! Scouts make pancakes, biscuits and all sort of "quick mix" stuff - the GF Bisquick will be a one box solution to several of his cooking challenges on scout outings. I am going to make a beef wellington, thinly rolling out the the g/f Bisquick dough before wrapping the meat in it and cooking it in the oven. I haven't been able to find this Bisquick mix anywhere and I've been looking in all our local Delco grocery and mass stores! I'm dying to try it. I've been gluten free for over 20 years and really miss good old fashioned warm and tender biscuits! I haven't seen this in the store yet, but I'd love to try it! Waffles and ice cream is a family tradition for my husband, and we'd like to introuce our kids to it, so that would be the first thing we'd make. I'd also love to make biscuits, oven fried chicken, and apple pie! Target now sells the Bisquick pancake mix. I found it at the Target on City Ave.
My 17 year old was diagnosed with celiac a year ago, and although she doesn't complain, I know she misses going out for pizza and fast food with her friends. I haven't found this mix yet, but when I do I'd love to surprise her with the aroma of "real Bisquick" baking powder biscuits. This pancake set would be great to send off with her to college next year for those middle of the the night study sessions. Wow! This set would be so much fun! I've been wanting to try Biquick's new GF mix and this would certainly help! Thanks for the contest! There are so many things I can think of to make, but first I'd want to try Pancakes! Since going gluten free - pancakes are one things that my daughter really misses and that I haven't found a "great" replacement for. I made the sausage bites and the coffee cake (added nuts and coconut to topping) and pancakes all with good results. Will keep this handy mix in pantry at all times. Even though we are now out of Strawberry season, I'd love to be able to make some shortcake with this new Bisquick mix. It is one of my most favorite and something I've missed in the summer since going GF. I am getting hungry for a GF Bisquick funnel cake! I would make pancakes!! I am a girl in college, and am struggling with cafeteria food! I can't believe I'm sating this-but I actually miss gluten free pancakes! I was diagnosed with Celiac's 2 years ago this month. Believe me it rocked my world. Being a fun, social beer drinking, pizza eating girl all my life I thought my game day tailgating was over. Low and behold how we adapt. I found GF beer and pizza. Not bad it's a work in progress. My one love around the holdays is baking and I have been experimenting. If GF Bisquick can help me accomplish my fomer super baker statis I would be a faithful customer for life. I am looking forward to taking it to my kitchen. I would love to win this contest and be able to make myself and my girlfriend delicious blueberry pancakes! Arguably our favorite type of pancake (along with chocolate chip! ), these just don't taste the same with the other gluten free mixes. It would be awesome to be able to wake up in the morning and not having to worry about what was for breakfast, or resort to making another batch of scrambled eggs. With both of us being college students, it is hard finding the time and energy to shop for gluten free flours and mixes to make our favorite baked goods (not to mention the price). Hopefully those searches will end with this GF mix! We've already tried the box recipe for coated chicken, and it was great—really crispy. Looking forward to good old Bisquick biscuits (with honey! ), and of course the pancakes. If I could find a box, or win one in a contest, I would love to make the Impossible Pie recipes! My grandmother used to make a fabulous and easy coconut custard pie with bisquick. My mom made Impossible Cheeseburger Pie, which is a super simple dinner idea!..I could certainly use 1 quick meal for everyone on any one of my busy weeknights! I can't wait for the ease in baking/cooking GF Bisquick will bring! I can't wait to make a creamy vegetable pot pie! Before I went gf, Bisquick was the easiest pour-on crust that baked into a great flakey/savory topper. I would make my famous peanut butter/caramel swirl pancakes for everyone so my sister wouldn't feel like the 'weird' one at the table. I can not wait to make sugar-free blueberry muffins again but now with the gluten-free Bisquick. I love muffins but a sugar-free/gluten-free combo is very hard to find.